Consumption of vegetables grown north of Cartago province do not pose any risk to humans despite their exposure to ashes from the Turrialba Volcano, the Costa Rican government says. Ash from Turrialba’s eruptions in the past weeks fell on several communities north of Cartago, and estimates from the Agriculture and Livestock Ministry (MAG) said that since the volcano resumed activity earlier this month ash has fallen on some 55 percent of the crops in the region. But despite the large amount of ash expelled during recent explosions, crops from the area are totally safe to eat as long as they are properly washed with clean water, according to a written statement from two government ministries. Agriculture Vice Minister Felipe Arguedas Gamboa said experts from the University of Costa Rica have been analyzing samples from farms in the region and all results so far ruled out the presence of toxic heavy metals in the ash. “Harvested produce from the areas surrounding the volcano is safe and can be consumed without any concerns. Our only recommendation is to wash them using clean water, as we usually do in our homes,” Arguedas said. Health Ministry officials added that they maintain a permanent coordination with the Water and Sewers Institute to ensure that water in the area is not affected by ash. 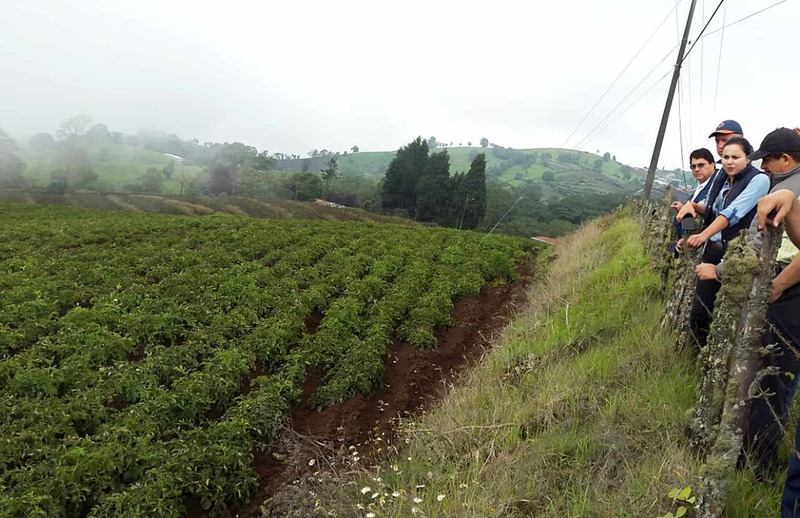 Farmers north of Cartago are the country’s top potato producers, supplying 80 percent of all potatoes consumed in Costa Rica, according to MAG. The region also is the largest producer of onions, while hundreds of other farmers also grow carrots, beets, cabbages, yucca, flowers and other crops. According to the International Volcanic Health Hazard Network, vegetables grown in fields covered by ash are safe to eat, as long as they are properly washed using clean water. Read the full report on health hazards of ash here. The last eruption that spewed ash from Turrialba occurred at 3:00 a.m. last Friday, according to the University of Costa Rica’s National Seismological Network (RSN). Current activity at the volcano, located 60 kilometers northeast of San José, consists mostly of moderate intensity tremors and a plume of vapor and gases, visible above the crater, the RSN reported.